KNOW. Helping people know God personally... embracing the belief that that everyone matters to God. GROW. Helping people grow in Christ spiritually... advocating progress, not perfection. What is Community First! Village? Community First! is a master-planned community in east Austin that provides affordable, sustainable housing and a supportive community for the disabled chronically homeless in Central Texas. Check out the 3 minute video below to learn more about the story of Community First! Where is Community First! located? Community First! is located approx 8 miles east of downtown Austin at 9301 Hog Eye Rd., Austin, TX 78724. 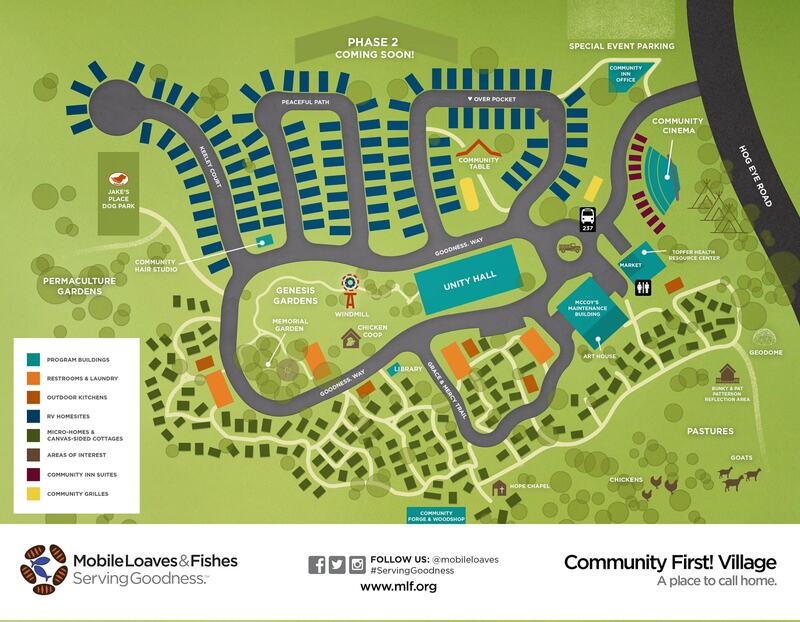 Here is a map and layout of the property at Community First! Is Community First! connected to an organization? Yes. Community First! was launched by the outreach ministry of Mobile Loaves & Fishes. The ministry provides food and clothing, promotes dignity and cultivates community to brothers and sisters in need. How is The Gathering set up as a Christ-centered mission at Community First!? The Gathering is a 501c(3) that supports the mission, vision and values of Mobile Loaves & Fishes. The Gathering is volunteer-led and 100% donor-funded through generous, tax-deductible contributions. To volunteer, click here. To donate and invest in The Gathering click here. Who is involved in The Gathering? The Gathering draws people from a variety of backgrounds, including the formerly homeless at Community First! to folks who live in Austin and beyond. We believe the heart of the mission takes place when those with abundance are willing to share and connect with those who lack abundance. Much of the service we provide in the name of compassion is done transactionally vs. relationally. We lean toward the relational. Is The Gathering a church? We describe ourselves as a Christ-centered mission. Our primary focus is on Jesus Christ. We are faith-based, not faith-biased and we welcome ALL people. Where can I learn more about getting involved and serving alongside The Gathering? Click here to learn about volunteer opportunities. Click here to learn more about The Gathering.